Here you can find some of FlightMemory's press releases and other press related information both linked (newer) and directly here on the page (our launch release). Please contact us, should you have any queries. New York City (May 21, 2007) - FlightMemory.com today announced the formal launch of an English language version of FlugStatistik.de, the popular German flight tracking and mapping tool. The website allows users to track their flight activity and graphically depict their trips on maps of the world to visualize their journeys. From the occasional traveler to the avid flyer, FlightMemory generates a flight activity logbook in real time. FlightMemory.com displays each user's key statistics such as total distance flown and approximates total air time. The website also provides users with total mileage flown in relation to circumnavigations of the earth and distances to the moon and even the sun. 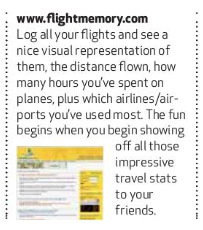 "FlightMemory is great fun for frequent flyers, flight crews, recreational pilots and aviation enthusiasts". "We are already keeping track of our newborn daughter's flights." Consumers may also order customized full-color satellite imagery maps of the world with their flight paths superimposed. Maps are available in a number of sizes and designs and make ideal conversation pieces for frequent flyers. "We are excited to bring this product to market in English" said Robert Heret, General Manager of FlugStatistik.de. "We have received almost daily requests for an English site from our 15,000+ registered users and are excited to make this request a reality." Statistics and maps aggregating all FlightMemory user data from the previous day may be found at the yesterday map. Sample custom posters may be found at here. FlightMemory was established in 2007 with the goal of combining three passions: geography, aviation and data into a useful and fun format. The website's free online flight tracking and mapping tools allow consumers to easily track and map their flight paths around the world. FlightMemory.com stands at the apex of the convergence of Web 2.0 and The Long Tail - combining access to user driven information with a highly targeted audience. FlugStatistik.de is a product of the Heret Informatik Service (HIS). HIS concentrates on statistical and spacious data solutions for internet applications. Other HIS products include: Koordinaten.net which provides mapping solutions, the FRA-radar, which provides real-time graphical displays of incoming flights of the Frankfurt Airport and a website, focusing on lost item statistics on the German Autobahn.